Jurassic World: Fallen Kingdom continues to deliver adventure and thrills with the introduction of new creatures that are more awe-inspiring and terrifying than ever before. Celebrate the newest action-packed Jurassic franchise when Jurassic World: Fallen Kingdom arrives on Digital and via the digital movie app MOVIES ANYWHERE on September 4, 2018, as then on 4K Ultra HD, 3D Blu-ray, Blu-ray, DVD and On Demand on September 18, 2018. To get you excited (and maybe a bit thrilled) for the upcoming release, I'm sharing an updated trailer with Home Ent. messaging and a "On Set with Chris and Bryce" video clip sneak peek from the new bonus feature. In this behind the scenes look from the all new bonus feature "On Set with Chris and Bryce," watch how stars Chris Pratt and Bryce Howard get pumped up before scenes on set and how their on screen chemistry has evolved with commentary from executive producer Steven Spielberg. That's just one of the great behind-the-scenes features you'll find when Jurassic World: Fallen Kingdom arrives on Digital, Movies Anywhere, 4K Ultra HD, 3D Blu-ray, Blu-ray, DVD and On Demand. 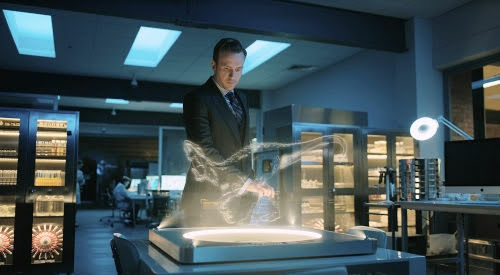 In Jurassic World: Fallen Kingdom directed by J.A. Bayona (The Impossible, The Orphanage) and executive-produced by Jurassic titans Steven Spielberg and Colin Trevorrow, Owen (Pratt) and Claire (Howard) return to Isla Nublar three years after the destruction of the Jurassic World theme park to rescue any remaining dinosaurs on the island from a catastrophic volcano that threatens to leave dinosaurs extinct once again. Owen is driven to save his lead raptor, Blue, while Claire makes it her mission to preserve the creatures that she has grown to deeply respect. When the lava begins to rain down, they soon discover terrifying new breeds of ferocious dinosaurs along with a conspiracy that could threaten the entire world. You can also complete your Jurassic library when the all-new five-Movie Collection is available on 4K Ultra HD, Blu-ray and DVD on September 18, 2018. 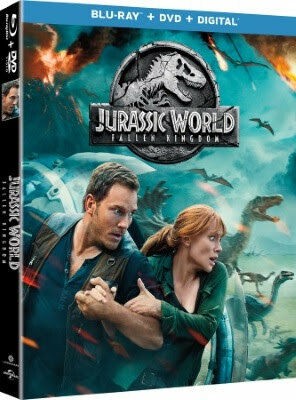 Now fans can experience the glory of all five movies in one complete must-own set including, Jurassic Park, The Lost World: Jurassic Park, Jurassic Park III, Jurassic World and the all-new movie Jurassic World: Fallen Kingdom.